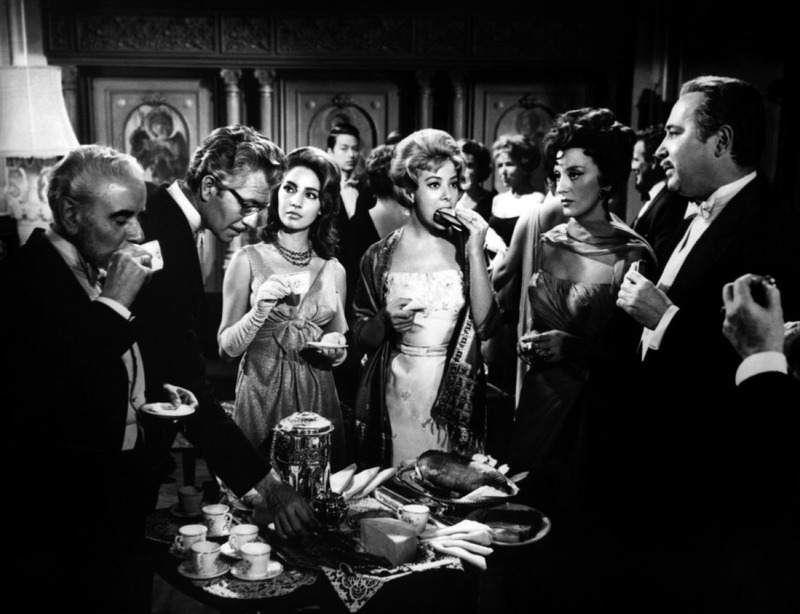 Luis Bunuel was good at excoriating the bourgeoisie; in The Exterminating Angel they are trapped at a dinner party for no apparent reason and their reason soon goes. The civil veneer of the the ruling classes is shown to be just that and beneath the surface most of them are scumbags (the doctor, however, is decent). Are the bourgeoisie these days the 1% who own 99% of the world’s wealth? Or do they include the ‘squeezed middle’ who politicians (including Labour!) seem so concerned about? Whoever they are they remain as self-centred as they have been since the rise of capitalism. The brutal behaviour of the guests in The Exterminating Angel is being meted out to the poor in Britain and elsewhere. Hopefully Syriza’s victory is the start of a left-wing revolution that will end the economic nonsense of ‘austerity’, the Tories announced today they are promising more if re-elected, that has devastated many people’s lives. Good on the Greeks, a third of whom live in poverty, for giving the ‘troika’ the finger. As Marx suggested the bourgeoisie are doomed, the only question is whether they will destroy the rest of us. Climate change, fuelled by unsustainable economic growth, will finish us off given long enough. However, given the stupidity of neo liberals who, irrationally, still believe in the ‘free market’, it could be that civil dissent causes a meltdown before Gaia does. Jack O’Connell was brilliant in ’71 and here he plays another working class lad brought up in an institution. There may be dangers of typecasting except the characters are so clearly delineated that there’s no possiblity of eliding the two. It’s another fantastic performance by this rising star. He plays Eric Love, a 19-year-old we see arriving in prison for a ‘very long time’; we don’t know what his offence is but it will be violent. Like previous posting, Whiplash, Starred Up seeks to make deeply unsympathetic characters understandable. Jonathan Asser’s script is immensely successful in this no doubt aided by his work as a prison therapist. 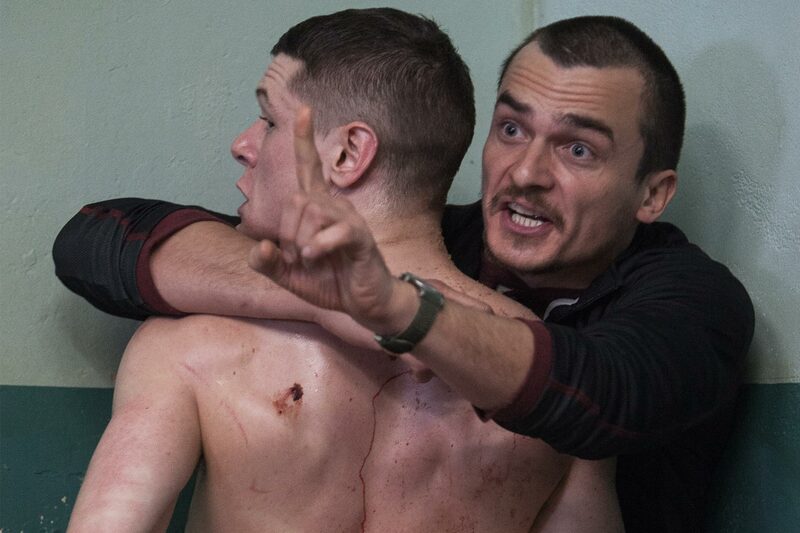 O’Connell’s is one of many superb performances; Rupert Friend as ‘O’, a therapist, manages to convey his own mental trauma with little explanation as to why he, without pay, wants to help these violent thugs. Thugs they are but they are also people who have become violent because of how they were treated, as children, and their immersion in macho culture. Melodramatically Eric’s father, Neville (Ben Mendelssohn – fabulous), is in the same prison and in one scene they sit down to ‘talk’: Eric has only one question. O tries to get the men in his group to have conversations with fellow inmates and hence empathise with each other and themselves. I see Eric’s behaviour, in the way he relates to authority, many times during the week in my work as a teacher. Young boys (mostly) who don’t want to learn academically and/or have ‘issues’ at home. The same surly refusal to engage, that O’Connell shows as Eric, marks them out, not as future criminals necessarily, but youngsters who are being failed by our education system. It is our duty to engage them. I’m not blaming teachers but the system that insists on ‘one size fits all’. The ones who are failed by the dogma destroying education are predominantly working class so the idiots running the Ministry of Exam Passing don’t care. The violence is extremely violent and the climax had me twitching in my seat, a tribute to David Mackenzie’s direction. A quite breath-taking movie. The intention of this blog is to write about ‘films with something to say’; that’s a bit of nonsense as all films have ‘something to say’. I’m trying to suggest the blog’s about films that have ‘something interesting to say’. Many films are interesting though I tend only to blog about films I like. I’m making an exception of Whiplash because it has been critically acclaimed whilst I detested it. If you’re planning to see the film don’t read on as there will be spoilers. In brief: the film celebrates JK Simmons’ character despite the fact he is a homophobic, racist, sexist, violent bully. Writer-director Damien Chazelle is trying to pull of that difficult trick of getting us to admire someone who’s abominable. Daniel Day Lewis managed to get me to sympathise with his monstrous Bill ‘The Butcher’ in Gangs of New York (US-Italy, 2002) and I understood the psychological torment suffered by Michael Fassbinder’s Edwin Epps, a racist in love with a black woman, in 12 Years a Slave; however JK Simmons’ martinet music teacher, Fletcher, is irredeemable. That’s not, I think, to do with his performance but because the premise of the film, that such bullying can be necessary to achieve greatness, is wrong. Greatness in musical performance, and other spheres, is achieved through talent and utmost dedication to practice. 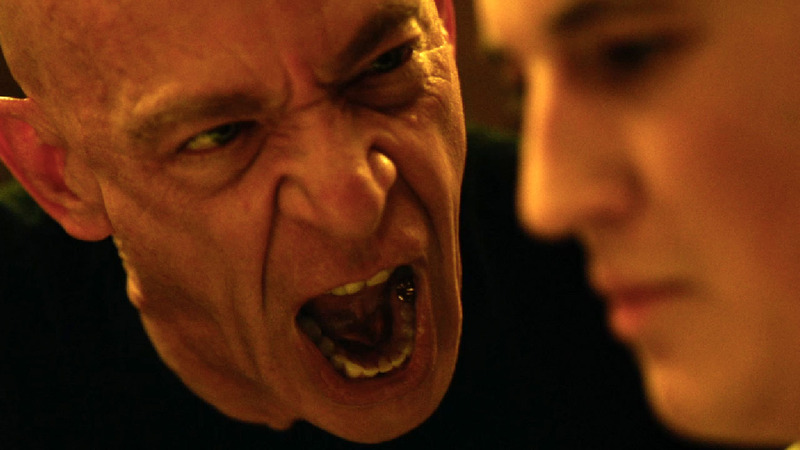 Whiplash does show that but the closing scene’s exchanged smile between the protagonists suggests that every vile thing Fletcher did was to the good is, for me, as vile as his character. Recently sexual abuse of pupils at an elite music school in Manchester has come to light (that’s one sin Fletcher is not guilty of) and high-pressured relationship between tutor and pupil can obviously be psychologically damaging. For Whiplash to acknowledge this, Fletcher has to resign after a bullied pupil (who nevertheless became successful) committed suicide, and then to say but really what Fletcher did to Miles Teller’s Andrew, a drummer, was right is reprehensible. I could go on about the absence of women, Andrew’s girlfriend only exists to be dispensed with and his mother is dead, but I won’t. The critics and audiences love the film (imdb is at 8.7) so I’m out of step on this one. Maybe because I am a teacher Fletcher’s dreadful behaviour is personal. I don’t know but I do know I hated this film. PS the music is terrific. The Bechdel test is mentioned regularly on the feminist sites I look at and The Green Ray, known as Summer in America, certainly passes. It follows Delphine (Marie Rivière) as she decides what to do after a friend dropped out of a holiday at the last minute. 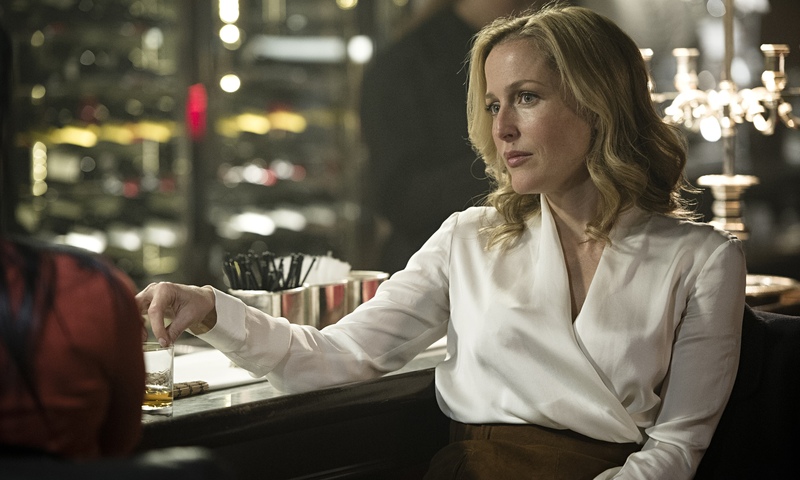 Delphine is unhappy and whilst the cause of this is because she’s been dumped by a man the film focuses on her desires rather then men’s. It’s ‘co-scripted’, or rather improvised, by Rivière and director Erich Rohmer and this, with the location shooting, where you can see passers-by looking at the filming with curiosity, gives the film a realist dimension. All the other characters are ‘playing’ themselves including Paulette Christlein, the ‘free spirit’ Delphine meets in Biarritz, who, like the other performers I sampled, never appeared in another film. The long-takes, and meandering narrative, is similar to the style and form that Richard Linklater used in his Midnight films; the subject matter is similar too. Not a lot happens, or rather, quite a lot happens slowly and I was wondering why I was enjoying the film so much as it seemed to be an example of Rohmer’s whimsy. It helps that Rivière’s is brilliant and the several locations used are beautifully shot. The revelation, toward the end, of what the ‘green ray’ is does give the film a weightier philosophical dimension. I don’t think the title Summer is a good one; presumably distributors were afraid audiences might confuse the film with science fiction. It has recently been re-released in the UK and it’s well-worth catching this film, particularly if you like Linklater. Schubert: ‘Death and the Maiden’, Paavel Haas Qt.